An event can be termed successful, when the guests recall the event time and again, long after it is wrapped up. Make you next event a successful one with the 90" Econoline Satin Overlays. 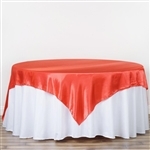 The simple yet stylish table fabric adds sophistication to the entire table ensemble. The simple yet colorful design of the overlays does a wonderful balancing act by avoiding the two extremes of being too much loud and getting dull. Spreading these amazing single colored table overlays across the countertop is sure to bring vivacity to the entire occasion. You also have a freedom to choose colors from more than 25 color variants like Yellow, Burgundy, Champagne, Purple and more. 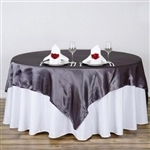 Made of the best quality Satin, these table fabrics are also highly functional and long-lasting. 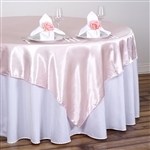 So, whether you are hosting a birthday celebration, a marriage ceremony, a blowout or any other gala event, the 90" Econoline Satin Overlays are the best way to spruce up your event. Purchase these runners from us and get the assurance of clear and transparent pricing and shipping policies.